Payroll outsourcing may seem like something that big companies do, but in fact SME’s can often be the type of company to benefit most from payroll outsourcing. To run a payroll efficiently you need resources, specialist software and expertise – which big companies can afford more easily than small companies. For small businesses, the costs of specialist payroll software and in-house payroll expertise is an overhead which is often disproportionate to the number of people actually on the payroll. But however costly or painful their current payroll set up, small businesses can be reluctant to move to payroll outsourcing. In this article we look at the most common worries or objections that small businesses have regarding the idea of payroll outsourcing and see how a professional payroll outsourcing service can solve or address these worries. But first, let’s look at what life is like for a small business owner running their own payroll. Payment Outsourcing – contact us today for a free review of your payroll. Let’s imagine a typical small business owner with a staff of, say, 6 people, one of which is a part-time admin clerk who helps out with payroll. He starts the day intending to work on a new business plan and make some phone calls to some potential new customers. But almost immediately he is interrupted by his newest member of staff coming in to tell him their pay hasn’t appeared in their bank account yet. He has to ask the admin clerk to check the payroll software to see if the payment was authorised and then he has to ring the bank to find out what’s happened. It’s now time for a client meeting and he doesn’t reappear till lunchtime. He settles down to work on the business plan again but notices that there is an email from HMRC informing him of some changes to the online filing requirements – he prints it out to read later. His calendar also reminds him that National Insurance filing deadline is just two days away – but the admin clerk doesn’t work on that day. So he has a difficult conversation with the admin clerk and the clerk agrees to come in on that day and do some overtime. It will cost some extra money but it’s better than getting a penalty from HMRC. Back to the business plan, but someone comes up from the workshop to say there’s a problem with the packaging that’s just been delivered. On his way back to his desk, the employee with the payroll problem asks whether it’s been sorted out yet. After a 10 minute chat our company owner agrees to sub the employee an advance on his pay – which will need to be accounted for and deducted from next month’s pay. He starts work on the business plan and then the phone rings. It’s the bank telling him that there was an error in the bank account information for the new employee and that a new payment will need to be set up with the correct details. He gets the admin clerk to make the corrections on the payroll software, before settling down with the business plan again. He suddenly remembers he wanted to make some phone calls, but it’s now after 2pm and he knows that the people he was going to call will be in meetings now. He makes a note to call tomorrow, and then goes down to the workshop to help out with an order that has to go out today. He’s spent barely 20 minutes on the business plan and made no client calls. His day seems to have been dominated by payroll issues – and that’s with only 6 people on the payroll. He wonders if there is a better way. If this scenario resonates with you, it could be time to think about payroll outsourcing for your business. What’s stalling your business growth? The ebook explores what could be stalling your company’s growth, from time bandits and lack of strategy to overburdening key staff and not planning your resources properly. If running payroll in-house is so problematic for a small business, why don’t more SME’s make the transition to payroll outsourcing? There are several common reasons, which we will look at in more detail. Small and medium businesses tend to be especially cost-conscious, and understandably so. SME’s quite sensibly try to minimise unnecessary overheads, by doing as much work in-house as possible to help keep down costs – so moving to payroll outsourcing may seem like an additional cost on the business. But in fact moving to payroll outsourcing can save companies money. They won’t need to pay admin staff to run the payroll, and they won’t have to buy and manage payroll software. They also protect themselves from the ever-present risk of incurring an HMRC penalty of potentially hundreds of pounds. But there are also time savings for business owners, freeing up their time to working on growing the business and generating income. Although there is an initial setup cost, this is relative to the size and complexity of the payroll – so getting it set up while the company is still small can be a good value route. Once set up, there is a fixed per payslip charge which means payroll costs are predictable. If there is a need to keep payroll outsourcing costs to a minimum, a payroll bureau option is cheaper than a fully managed option, but retains all the compliance and reliability benefits of payroll outsourcing. 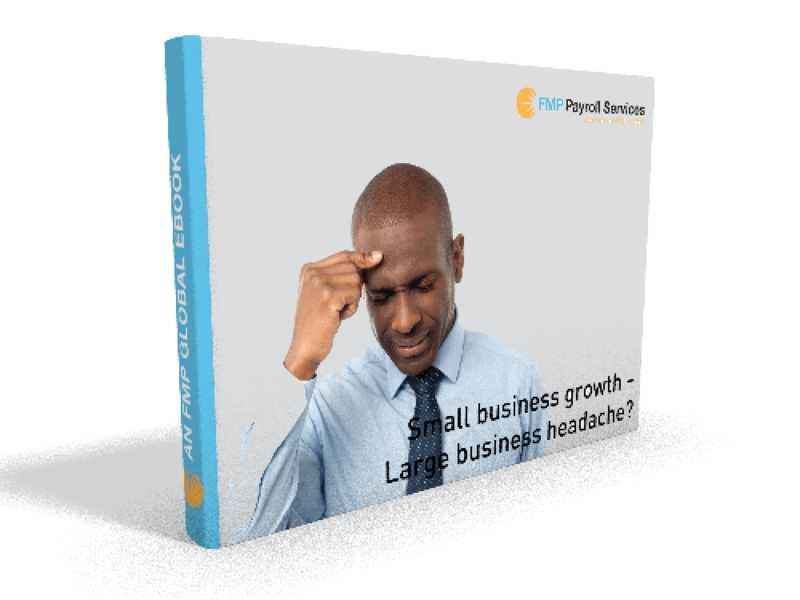 Many small businesses worry that they will lose control over their payroll if they outsource. But with FMP Global you retain all the visibility and control you want. You will be provided with regular reports as standard, and you can request additional reports at any time. If you choose the bureau service you will have direct access to the software and can run your own reports whenever you like. The bureau service also means you keep control over data entry and can still operate any internal checking or auditing procedures prior to data entry. In addition, you have access to a dedicated Payroll Manager who can respond to queries or problems straight away. Many small and medium businesses are so overwhelmed by running the business on a daily basis that they don’t feel they have the time to think about making strategic changes to the payroll system. At FMP we have an established procedure for bringing on new clients, which is designed to minimise the time you need to personally spend making the transition. And moving to payroll outsourcing will save you time in the long run. Outsourcing your payroll will entail giving employee payroll information to your payroll provider i.e. rates of pay, bank account details etc. And this can raise questions about confidentiality and data protection. But how safe is your employee data right now? If it’s sitting on a computer in your company’s office, it is only as secure as your office. Not only that, the people authorised to see that data, are also company employees who will very likely know your other employees personally. In fact your employee data can be even more secure when kept by an impartial third party with stringent server security in place. Many business owners like to have someone in the office who is on hand to deal with problems as they arise. But depending on a single person can mean you actually have less control over sorting out problems quickly. People go on holiday or have days off sick. They also have lunch breaks or need to go home suddenly in an emergency. By outsourcing you avoid this dependence. At FMP we have a large team of professionals to call on to help deal with any problems, and you will be assigned a dedicated Payroll Manager who you can call at any time. This means there will always be someone there to talk to and start work on resolving your issue straightaway. It would be too disruptive to the business to change what we are doing. At FMP we try to make the transition to outsourcing as painless as possible. We carry out a complete requirements capture and then build your system. When it is ready we carry out extensive testing alongside your existing system to ensure it is running correctly, before switching you over to the new system. Once the new system is running, any teething problems or future issues are the problem of your payroll provider to sort out. So while there may be some initial disruption, you will ensure much less ongoing disruption due to payroll problems in the future, which all means better focus on running your business. In short, whatever your worries about moving to outsourcing, FMP Global already has a solution and a process in place. We aim to give small and medium businesses one less thing to worry about, freeing them up to concentrate on the important business of growing.